The audio market is unusual these days in having numerous manufacturers who are artisans, hand crafting with care their beloved products for what seems a diminishing market. 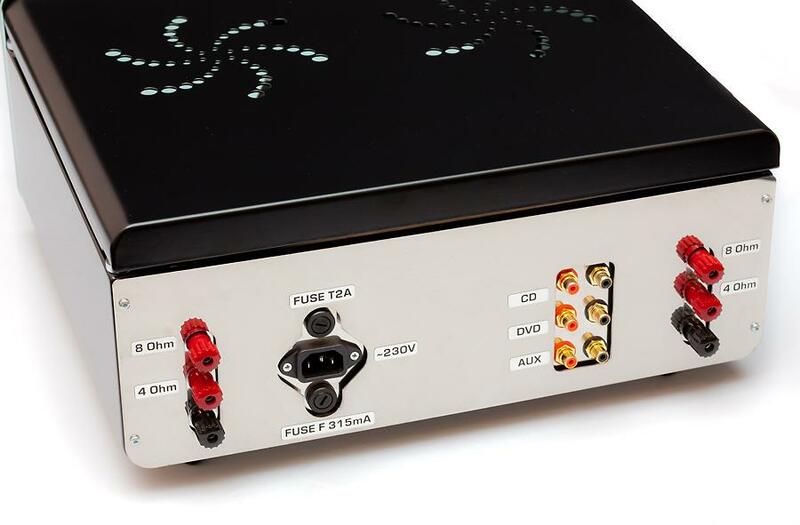 It is rare to find an artisan who is prepared to design and manufacture something like an integrated amplifier that not only looks different but also uses a circuit design that is beyond rare. When you first look at the Egg-Shell you may think (avoid looks for now) we have a conventional push pull EL34 tube amplifier. In fact the Egg-Shell does use EL34s but in parallel single ended configuration which is rare but not unique. What makes this amplifier different is that the EL34s are wired in triode mode. The output tubes are also setup with automatic bias adjustment so there is no need for a meter and fiddly adjustments. The input section contains a brace of EF86 and ECC83 with my example using a nice pair of Mullard ECC83 and Harmonix EF86. The rear panel sports the ubiquitous IEC main input socket, three single-ended RCA phono inputs and the now standard 4/8 ohm 4mm banana plug and spade connectors. Now back to the looks. 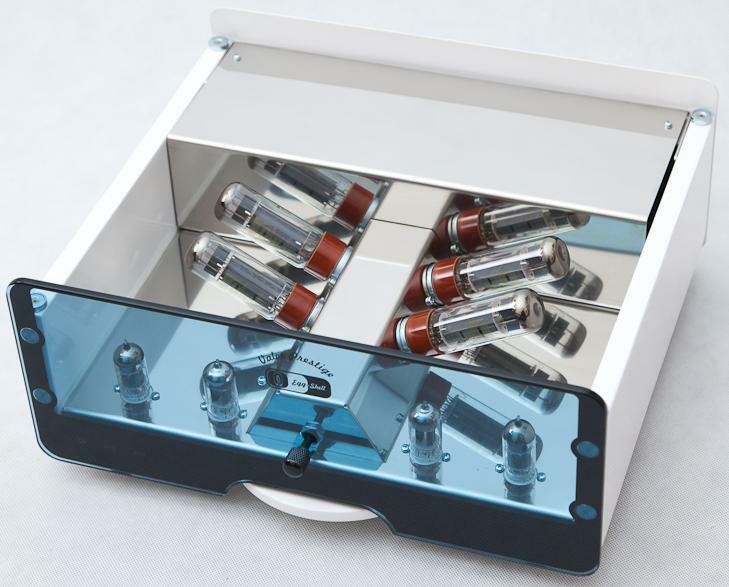 We have had amplifiers with the valves laid out in a "V" format before, the EAR Yoshino V-12 is an example, though the lovely valve collection is hidden behind some hideous folded, perforated metal covers. In the case of the Egg-Shell the valves are covered to protect those little wondering fingers whilst you can still see the wonderful glowing tubes through the glass front. The top is simply and adequately held in place using a magnetic retention system enabling quick removal when you want admire the layout more closely. 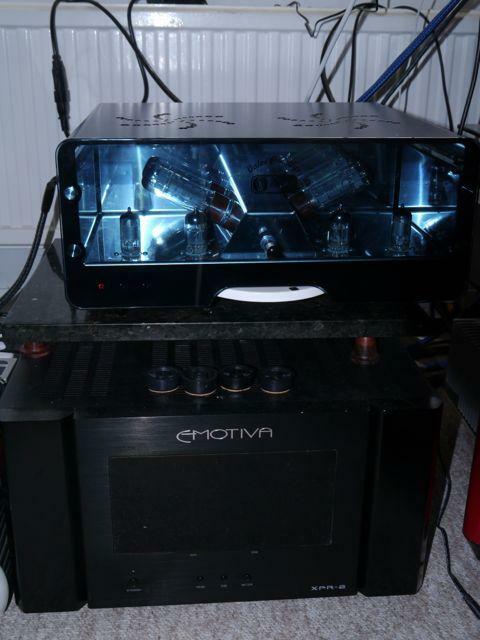 The valves are further enhanced with mirror clear, chrome plated metal panels behind making the amplifier look fabulous. To add to the unusual layout is a volume control that is a horizontal wheel with the small knob above being the input selector with the selection indicated by illuminated numerals. The example I had for review had nothing on the volume control to indicate the current setting apart from "0" which you could not see when the volume was turned up beyond zero. This issue is being addressed in current production with markings around the edge of the control wheel. Another unusual feature is the power switch, there are two and they are underneath on the righthand side. The switch nearest the back is for the heater supply and is applied first, the second switch is then applied about 20 seconds later and is for the high voltage supply. The amplifier was not supplied with a mains cable so I used a Normality IEC mains cable from my favourite source Lazarus Technology. The speaker and interconnect cables were from AudioQuest and I used a PS Audio P500 mains regenerator to provide a clean supply. In my area the local supply voltage fluctuates a lot, is rather noisy and in my experience the P500 gives a much more consistent quality to the sound. The amplifier came with the EL34s removed so it was a simple matter to remove the lid and fit the valves, the location was indicated on the box but as automatic bias is used the precise location should not matter. A solid and stable support should be used and as my rack was full I used my Emotiva amplifier as the base then used some Acorn feet and a marble platter on top on which to to place the Egg-Shell. When first setup and using Divine Acoustics Proxima speakers the sound was obviously very detailed and perhaps a bit light weight. I then let the system settle in for 24 hours before experimenting with speaker position, power suppy and cables, the speakers were pushed back nearer to the rear wall and a little closer to the side walls which gave the sound more weight. Adding the PS Audio P500 mains regenerator and Normality mains cable took the edge off the very detailed sound. Another 24 hours went by and the sound became more relaxed and listenable. It may be that what was happening was that I had got used to the more detailed sound! As a comparison I used my Stirling Broadcast LS3/5a like speakers, the case is much the same, the drivers and crossover are different but the have been voiced to sound similar to the original LS3/5a design from the BBC. When I first saw the Egg-Shell Prestige amplifier I thought the layout at the front a bit odd and was not convinced over the usability. In practice the Egg-Shell has been a delight to use, the volume control works well and with the addition of markings to indicate the position it is refreshing change from the usual solution. The Egg-Shell is very quiet in operation with no obvious noise from the speakers or amplifier. As mention earlier the amplifier is very detailed, the resolution is something I have not heard before and this means the sound stage is better resolved and believable. The downside is poor recording quality is revealed and so some previously acceptable albums become more difficult to listen to. In my experience I have always found that getting the volume setting right for a particular recording was very important. Below a certain level the sound seems to collapse and become less interesting. With the Egg-Shell this behaviour is much less obvious, so listening at low volumes is a much more interesting experience. You can listen at night without annoying the household or neighbours! For a valve amplifier the Egg-Shell has very tight bass, possibly an artefact of the solid state high voltage power supply. The solid bass is a welcome change though it is offset by the treble being less sweet than you might expect from from a valve amplifier. For those who have the right speakers, and prefer the softer bass and sweeter treble, there is a version of the amplifier with just the one EL34 per channel and valve rectification for the HT supply. The downside of this more traditional design is less power at 9w per channel, and consequently you will need speakers with a sensitivity of more than 90dB/W. When paired with my LS3/5a speakers the combination gives a very compelling presentation, tight, clean and sufficiently detailed and with an adequate volume level. You can annoy everyone if you want! My favourite recent track from Elton John is The Bridge from The Captain & the Kid album, Elton's voice is beautifully presented, dead centre and with clear articulation, whilst the backing vocals hang above and behind. The piano is rich in tone, and the timing just about right, some systems can sound slow which is not the case here. Moving on to a wonderful recording of the Allegri Miserere by the Tallis Scholars, the Egg-Shell and LS3/5a combination give a very natural and finely detailed presentation. The singers in the foreground contrast beautifully with those in the background ,who hang way back in the acoustic yet are clear and fully featured. In some systems I have used, the background singers can be very vague and difficult to make out. As an extreme contrast I put the Michael Jackson album This is it disc 1 and my favourite MJ tacks Billie Jean and Beat it, the beat (rhythm or timing in audiophile speak) was infectious, this prompted me to crank up the vinyl collection and the original Jackson album of Thriller to see how the same tracks compared. I have to admit it was a little disappointing. Perhaps the LP was worn out as it has been played hundreds of times. The sound was gritty and a bit on the harsh side, usually it is the digital sources that sound this way! In order to let the vinyl replay system redeem itself I popped on New Favourite, the 2001 recording by Alison Krauss and Union Station, immediately things were better, the inter play between the dobro and banjo on Choctaw Hayride was clear with great rhythm and timing. The instruments were portraid most realistically, you could almost see the two musicians sitting in front of you. It was so good I had to play the album all the way through which is unusual for me when writing a review as time is short. It is very nice to see an artisan manufacturer expressing their skills in their own way and not following the herd! The circuit, functional and style design are different to anything that has passed my way before. The functional and style differences have not compromised the usability in anyway for me. It did take a few hours to appreciate how well these differences have been thought through and become used to the layout. The looks for me are stunning, and warrant a nice rack on which to display the Egg-Shell. The sound is very revealing and, when setup well with the right speakers, very rewarding with a sound quality that sits in the middle between solid state and valve. The amplifier sensitive to the setup and supply quality, a clean mains supply is essential. There is adequate power for most speakers although I did refrain from using my Magneplanar SMGa as they do need lots of power and a low output impedance from the amplifier to control the panels. Encore 7 are an interesting manufacturer with a number of new items on their way. From February 2014, the Egg-Shell will be available with remote control for the volume in an innovative design, the original version will still be available. Also in February there will be a new version of the Egg-Shell using a single KT88 per channel in single ended ultralinear mode and tube rectification producing 10W per channel. In the second half of 2014 there will be a phono stage in a similar case to the Egg-Shell, I look forward to hearing that. Encore 7 are actively involved in promoting photography and music in Poland and this passion shows through in their products. Currently Encore Seven hosts the live Music Photo Contest as part of the best Polish Jazz Festival, see Lotos Jazz Festival supported by Radio Katowice for details, you will need to be able to read Polish!